The release of this 2-disc Forbidden Planet set is greatly welcomed. Seeing the movie in all its digitally re-mastered glory makes one conscious of what a superlative achievement it was, both in the context of its time and in the wider impact it had on the sci-fi movie genre. 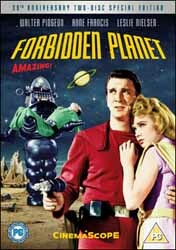 Forbidden Planet takes as its central theme from the darkest fantasies of vengeance and retribution buried in the human psyche. What if those fantasies, unknown to the conscious mind, could take on physical form, and realise these furious, repressed desires - even to the point of murder? Such themes had already been explored in literature, notably by Shakespeare in The Tempest - a source acknowledged by the writers of Forbidden Planet - and by Robert Louis Stevenson in Dr Jekyl and Mr Hyde. More potently, Forbidden Planet was conceived at a time when Freudian psychology was at the height of its popularity in the US. Its central message was that no matter how rational 'scientific' man might think himself, his primitive passions - his destructive Id - remains buried below the surface of the mind, fighting a subterranean battle for recognition and existence. Dr Morbius is thus a complex anti-hero, very different from the cardboard cut-out 'mad scientist' villains so popular in fifties sci-fi. It is his subconscious Id which takes physical form to kill those who threaten his control of the knowledge of the dead Krell civilisation. And it is his Id which returns - again without his conscious knowledge - to murder the crew of the space captain who dares take away his beautiful daughter. The movie shapes powerfully towards Morbius' climactic confrontation with his own subconscious as the Id monster batters down the door to murder Commander Adams. This coruscating drama takes place in an alien environment hardly bettered for sheer scale and atmosphere even by the effects-laden sci-fi behemoths of the '70s and beyond. This DVD is a digital transfer from restored picture elements and conveys the majesty of the original in full force. The planet's surface, the interiors of Morbius' house and the distant planets and starfields are all convincingly realised. If you are new to the movie or have not seen it for some time, prepare to be awe-struck by the monumental matte work which represents the subterranean power plants of the Krell - and which makes the similar sequence in Star Wars pale by comparison. The sense of a truly alien world is enhanced by the movie industry's first all-electronic 'music' score. It was a bold decision indeed by MGM to abandon plans for an orchestral score and give sound designers Louis and Bebe Barron licence to develop an electronic soundtrack for the full 98 minutes of the movie. Those familiar with Delia Derbyshire's struggle to create a few tape loops for the Doctor Who theme in a world without synthesisers will realise what a staggering achievement this was. Each tone had to be generated and recorded individually using oscillators of the type used to test phone lines, then the tape spliced together manually. The electronic soundtrack in Forbidden Plant has a double function: to create a constant, all-enveloping soundscape - rendered the more effective by 5.1 remastering in Dolby Digital - and to mirror and anticipate the action exactly as a conventional score would. To fully grasp MGM's sonic and visual achievement with Forbidden Planet, the viewer needs to remember the context. In 1956, when the movie was released, sci- fi cinema featured unconvincing stop-action monsters, cardboard heroes, cheap special effects and predictable storylines. Movie studios simply did not take the genre seriously. The decision by a major studio like MGM, then at the pomp of its Singin' in the Rain glory, to take on a science fiction theme, meant that something more serious would be attempted - particularly given the critical and box office success of its other foray into fantasy worlds in The Wizard of Oz back in 1939. It was the glamorous halo of MGM which attracted such strong character actors as Walter Pidgeon to a genre they might not otherwise have considered. In turn this meant the movie was played as a straight tragedy, with convincing characters moving through their own arcs of self-discovery. The movie's innovation and attention to detail extend to the iconic robot, Robby. Up to this point in B-movie sci-fi, robots were generally hostile and crudely realised. Robby by contrast is an altogether more complex creation: helper, facilitator, butler, food synthesiser - yet still able to menace when protecting Morbius' household against unwanted guests. Robby's design is a fine example of form following function. With essential systems like gyroscopes and sensors clearly on view, this robot looks like it might actually work. From early drawings - which can be seen on the Extra's on the DVD - things might have been very different. A simple 3-piece design animated by stop-motion was seriously considered. It is clear today that Forbidden Planet shaped profoundly the visualisation of alien landscapes in movies and TV series throughout the 1960s and 1970s. One cannot fail to be struck by how the movie anticipates Star Trek's rock-strewn planetscapes, phasers, communicators, and the juxtaposition of strong but vulnerable commander and mentor doctor. Along with the re-mastered movie and soundtrack, this package contains a good fist of extras which help illuminate the gestation and development of Forbidden Planet. Particularly interesting are test reels showing sequences before the application of special effects - which incidentally were realised by one of Walt Disney's top animators. These include sequences of the Id monster attacking the compound and the landing of the spacecraft on Altair 4. Altogether there are 13 minutes of deleted scenes and ten minutes of lost footage. Setting the context of Forbidden Plant is a documentary, Watch the Skies, which looks at 1950s Science Fiction, as well as documentaries on the making of Forbidden Planet and on Robby the Robot - although the latter reprises much of the same material. There are also some hilarious MGM promotional shorts in which Walter Pidgeon jumps into character to introduce Robby the Robot and Forbidden Planet. Finally there are two examples of vehicles starring Robby the Robot: a feature film, The Invisible Boy, and an episode from the TV series The Thin Man (Robot Client) in which the robot takes on a more traditionally menacing role.